The cryptocurrency market saw the bull running rampant and causing a hike in most cryptocurrency prices. However, the market is now attaining new normalcy. Tron [TRX], the ninth largest coin on CoinMarketCap, noted a fall where it slipped from the eighth position to the ninth position. At press time, TRX was valued at $0.0249 with a market cap of $1.6 billion. The ninth largest cryptocurrency noted a 24-hour trading volume of $140 million. The coin registered a growth of 3.09% over the last week. The one-hour chart for the coin noted an uptrend from $0.0239 to $0.0251. Due to the current spike in the market, no significant downtrend was recorded. TRX traced resistance at $0.0253 and support at $0.0251. Bollinger Bands appear to be converged, suggesting reduced volatility in the market. The moving average line is under the candlesticks, marking a bullish market. Awesome Oscillator indicates a bullish market losing momentum. Chaikin Money Flow points towards a bearish market as the marker has dipped below the zero mark. 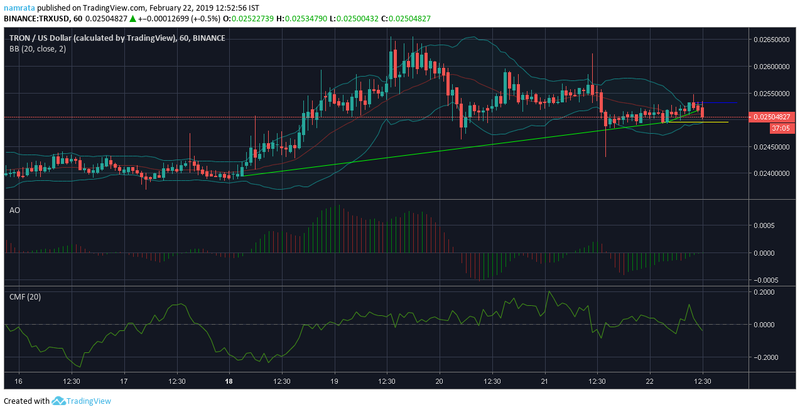 The one-day chart for the coin noted a downtrend from $0.0182 to $0.0119, followed by an uptrend from $0.0132 to $0.0239. 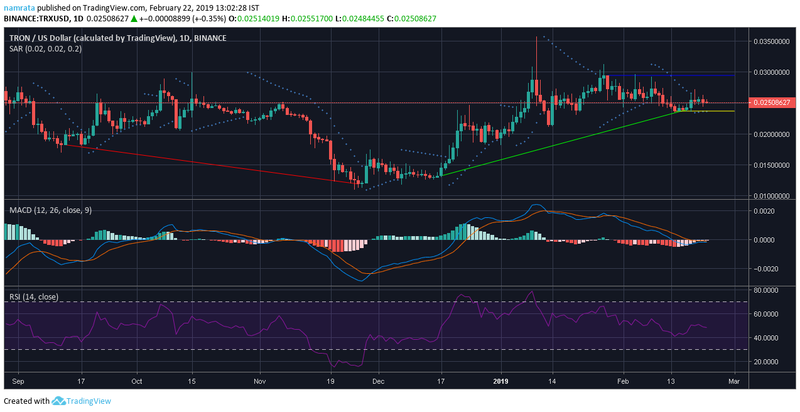 TRX met resistance at $0.0294 and support at $0.0236. Parabolic SAR indicates bullish momentum in the coin market as the markers have aligned themselves below the candlesticks. MACD line is under the signal line, indicating a bearish market. A majority of the indicators, Bollinger Bands, Awesome Oscillator and Parabolic SAR predict a bullish market. However, Chaikin Money Flow and MACD forecast a bearish reign in the bullish market.